You are here: Home / Great Deals / Hype Retro Handset For Mobile Phones, Tablets & More Only $7.99! Down From $39.99! Ships FREE! 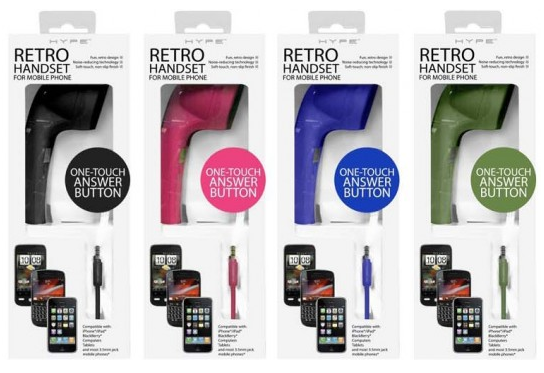 Hype Retro Handset For Mobile Phones, Tablets & More Only $7.99! Down From $39.99! Ships FREE! GearXS has this Hype Retro Handset For Mobile Phones, Tablets & More on sale for $7.99! (Reg. $39.99)! Become a true hipster with this retro-styled handset inspired by the mid-century telephone. The handset plugs into your cell phone’s 3.5mm audio jack. Enjoy clearer sounding calls and reduce your exposure to cell phone radiation in a colorful, stylish and fashionable way. This Retro Handset is finished with a luxurious soft-touch exterior and has a high quality speaker and microphone. Health conscious celebs are picking up the retro handset mobile hype! It won’t be long before we all use a retro handset on our mobile phones!